I am a girl who can appreciate easy. I like furniture that is easy to assemble. I like electronics that are easy to use. I like places that are easy to find. It should come as no surprise, then, that I also like meals that are easy to cook. 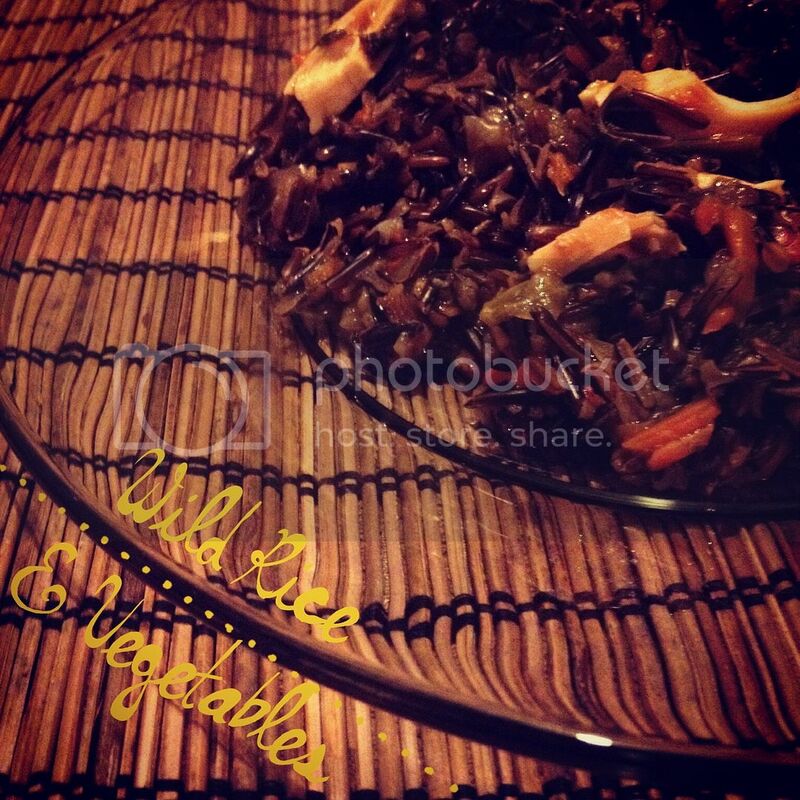 This one pot wild rice and vegetable meal is most definitely easy. If you want to add meat to this dish, you can. I cooked some chicken tenders separately and added them at the end, but you can omit the meat entirely or use a different protein. Just note that if you are using protein and your protein isn't already cooked, now would be a good time to put it in the oven so that it is ready at roughly the same time as the rice and vegetables. I used a rice cooker for this recipe, but if you usually make your rice on the stove, you can probably achieve the same result with your usual method. I used wild rice here, but any type of rice will work. Just make sure you follow the rice to liquid ratio on the package instructions. To make this meal, you measure out the amount of rice you wish to use and rinse it. Add your rinsed rice to your rice cooker. Next, add your favorite vegetables. I added fresh mushrooms, baby spinach, frozen white onion and frozen carrot shreds. Next, add liquid according to the instructions on the back of your rice. 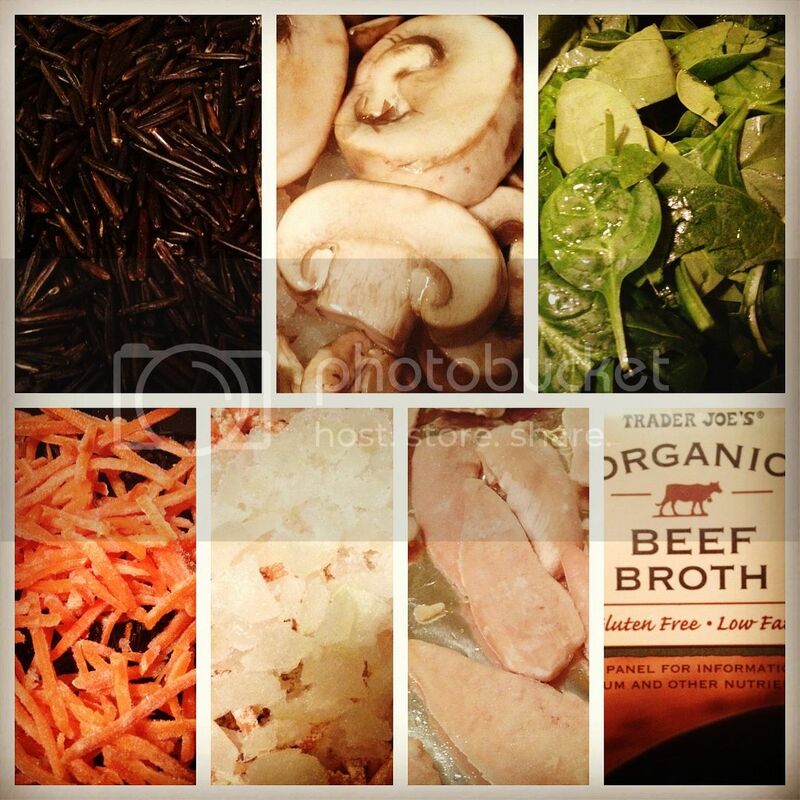 I used Trader Joe's wild rice and it said to use 4 parts liquid to 1 part rice. I cooked my rice in beef broth for added flavor, but you could use vegetable broth or water instead for a vegetarian-friendly alternative. If you want, you can add your favorite seasoning blend to the pot at this time. I added a general tso's stir fry seasoning mix, two splenda packets, and a little bit of soy sauce because I was craving stir fry but didn't want to babysit a wok. I'm guessing that there are a lot of powdered soup mixes and other spice blends that would be equally delicious. Do some experimenting and figure out what you like. Once everything is in the rice cooker, put the lid on top and turn it on. Cook until all the liquid is absorbed. My rice cooker automatically switches to warming mode when it senses that the liquid has been absorbed, but your rice cooker may be different. If you put chicken or another protein in the oven, don't forget to check it periodically while the rice is cooking. Wild rice takes a while to cook, so my chicken was cooked through about ten minutes before my rice was done. When the rice finished, I shredded a few of the chicken tenders and stirred it into the rice and vegetable mixture. I stored the leftover chicken for later meals and sat down to a healthy dinner. I make some variation of the recipe a few times per month. Sometimes I substitute quinoa for the rice, and I just use whatever vegetables I have on hand. I have Crohn's Disease and I need my vegetables, including greens, to be extremely well-cooked to avoid digestive issues. If you prefer, you can add the spinach at the end after everything else is finished cooking to keep it from wilting down to nothing. Or you can use a heartier green than baby spinach. Or no greens at all. Maybe you would rather have sweet peas. Or edamame. Or something else. This recipe is super versatile. Don't you love choosing your own adventure?